Trials has come a long way since its beginnings as a Flash game and yet remained in the same, sweet spot, as if the whole series has performed a backflip. Although it’s gone through a number of visual glow ups, the challenging and precise platforming that defines Trials has remained, and Trials Rising has a whole new world of gravity-defying and stupidly dangerous tracks for fans to burn rubber on. 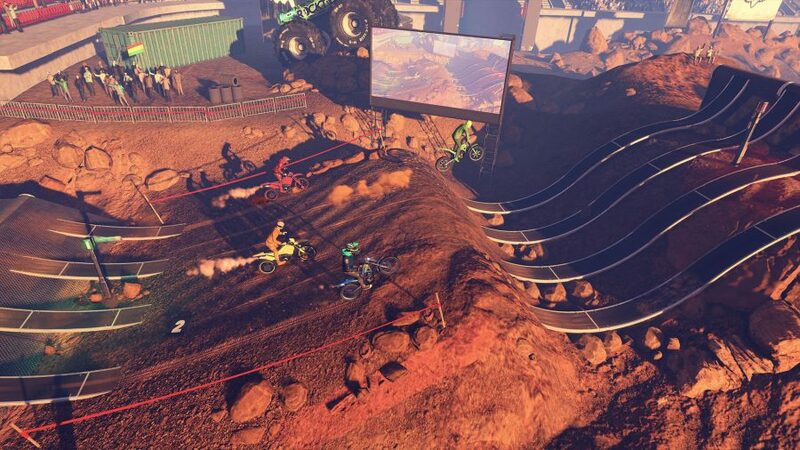 Leaving the gleaming metallic tracks of Trials Fusion in the dust, Rising takes place in a variety of spectacular present-day locations around the world. The track menu has been replaced by a map of Earth, with little pins indicating where the tracks are. Grounded is relative, though: after completing the quick tutorial you’ll be backflipping off the Eiffel Tower and revving up the side of Everest in no time. When I wasn’t repeatedly face-planting into the edge of a platform, I was admiring the impressive environmental surprises on the tracks. I’ll definitely remember the free fall drop from a plane in Russia, or kicking up dirt under a setting sun in Yosemite National Park. The Hollywood track in particular has one major mid-run surprise. You bust into a bustling film set with a giant green screen, which as you zoom past switches to an action-packed alien battle scene. It’s fun, bombastic, and also happens to be Ilvessuo’s favourite track. These surprises act as markers along the course, helping riders remember the order of tricks and skills. For riders who want to aim for nothing less than perfect, these visual cues are vital. You might best know creative director Antti Ilvessuo from his memorable entrance to the Ubisoft E3 conference last year. Arriving on a dirt bike, Ilvessuo rode up the centre aisle of auditorium, walked up onto stage and then smashed through the podium. Probably for the best they didn't have him jump through a ring of fire. Track knowledge and bike balance are the keys to success in the Trials series. When you get into the flow and understand the particular rhythms of a track, it’s the best feeling. Which means getting the physics of the rider right is a vital task, and one RedLynx is well aware of. The difficulty curves, literally and metaphorically, go pretty high. RedLynx has sought help from community site Ninja Central for some of its most devious levels – ones I’ll need to experience vicariously through YouTube if I’m ever going to see them. If becoming a Trials dirt bike ninja seems like a lot of dedication then there are plenty of other special challenges, sponsorship missions, and stadium competitions for you to take part in over the globe. What’s more, RedLynx has taken a whole other route to dizzying brilliance with the tandem bike, a co-op game mode where each player controls 50% of the bike. These are different paths to a familiar, satisfying peak. 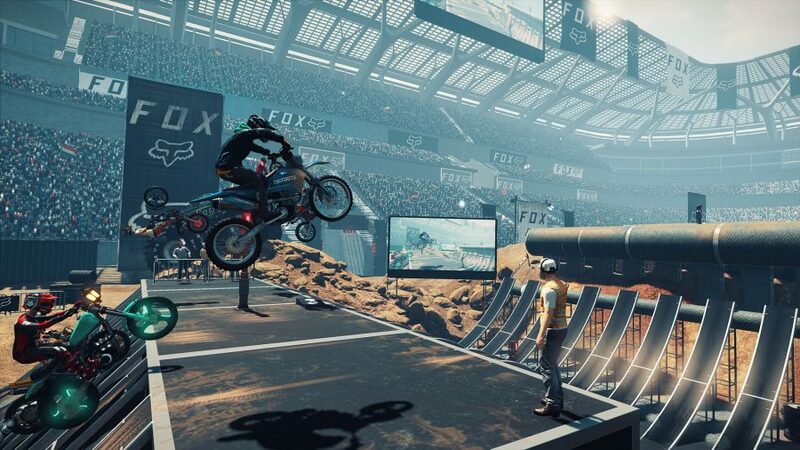 Trials Rising has the same tight controls and crazy stunts as its browser ancestor, just on a bigger stage – a stage packed with pyrotechnics that fling your lifeless body from your bike after attempting to backflip off the Great Wall of China.